Bingo Industries has been a loyal and committed Partner of Planet Ark since 2011. Through this exclusive partnership, we're working together to increase the amount of construction and demolition material that is recycled. We're also finding ways to encourage more businesses to choose a verified and trusted recycler. 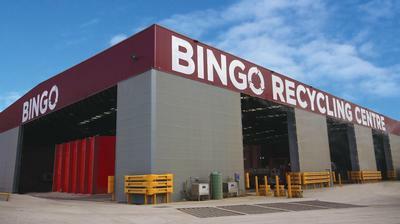 The team at Bingo are excited about helping you recycle, that's why they're Associate Sponsors of Planet Ark's National Recycling Week and a Proud Partner of RecyclingNearYou.com.au and Business Recycling. As part of their deep commitment to positive environmental action, Bingo is also working closely with Planet Ark to assess the environmental impact of their business operations. A one stop shop for waste management. Bingo is an Australian operated waste management and recycling company, with more than a decade of experience providing waste management solutions to a variety of businesses and industries. Whether it's skip bins for the building and construction industry or commercial waste bins for business, industrial and commercial industries, Bingo has an affordable, reliable and sustainable solution to suit. At Bingo, they love recycling! As a one-stop shop waste management company, the Bingo team will help you manage any waste type. Because Bingo is committed to recycling everything possible, they offer services that minimise the amount of waste you send to landfill, which can save you money and time. Everyone at Bingo believes their services play an important role in helping businesses and households reduce their impact on the environment. Planet Ark has verified that every Bingo Skip Bin goes to a recycling centre after it leaves your premises, meaning that your refuse has the best chance of being reused and recycled. Bingo Recycling Centres use state-of-the-art sorting technology to ensure that everything that can be recycled, is recycled.